In less than two years, the industry has converted to ship all new aircraft with glass cockpits, rather than traditional instrument panels. The most popular of these is the Garmin G1000, and now there's a comprehensive guide describing how to operate these airplanes: Max Trescott's G1000 Glass Cockpit Handbook. This book makes it easy for you to quickly become an expert on operating and programming the G1000 system in any aircraft. Instructors agree that the cockpit is not an ideal learning environment. 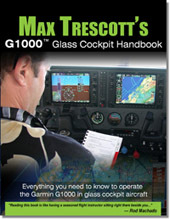 Reading this book, written by a Master Flight Instructor, is one of the most efficient and cost effective ways to learn the G1000 before stepping into the cockpit for your first transition lesson. Get the single source of information that educates pilots about all of the features and benefits of flying the G1000, and how features vary among aircraft manufacturers. Whether you fly a Beechcraft, Cessna, Columbia, Diamond, Mooney or Tiger, you'll learn which G1000 features apply to your particular aircraft. Or, if you're planning to buy a new Very Light Jet (VLJ) like the Cessna Mustang or Diamond D-Jet, this book will help you prepare while you wait for delivery.